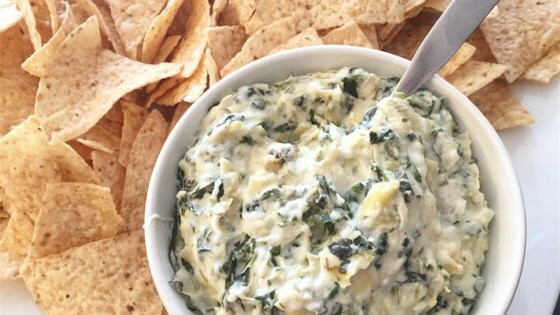 "This dip is amazing -- so cheesy and fragrant. If you don't like artichokes, don't worry -- you'll never know they're in there! My only question is: Is it okay to just eat it with a spoon right out of the dish?" my boyfriend loves spinach artichoke dip and he wasn't too impressed with this. sorry! This is always requested at my dinner parties...ever since the first time I made it a few years ago. It goes very quickly!!! Perfect recipe!! Better than any restaurant's dip that I've ever had.